The following callouts relate to actions associated with change requests. Some of the callouts can be set up using a dialog as described below. Others required direct setting of nodes in the ^%vcvc global. 1. Navigate in the folders panel to Setup -> Properties -> Change Requests. 2. In the new dialog, enter the details of each callout into the relevant field. See below for more details. Note: When this callout is called from the change request maintenance function, fcode is CHMAINT and the values for obv, lcode1 and lcode2 are null. This callout is called when a change is made to the status of a change request. It must be written as an extrinsic function. This callout is called when details of a change request are saved. It must be written as a line label or routine call. The empty parameters exist for back-compatibility. This callout is called when an object is being added to a change request. It must be written as an extrinsic function. To install the callout, set ^%vcvc("changeRequestValidate.AddObject")="label^routine"
This callout is called when an object is being removed from a change request. It must be written as an extrinsic function. 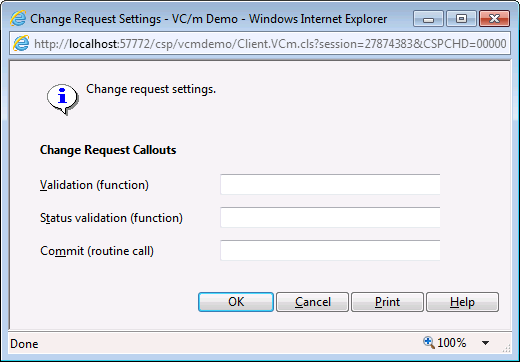 To install the callout, set ^%vcvc("changeRequestValidate.RemoveObject")="label^routine"
This callout is called when a change request is being added to a change request. It must be written as an extrinsic function. To install the callout, set ^%vcvc("changeRequestValidate.AddCR")="label^routine"
This callout is called when a change request is being removed from a change request. It must be written as an extrinsic function. To install the callout, set ^%vcvc("changeRequestValidate.RemoveCR")="label^routine"